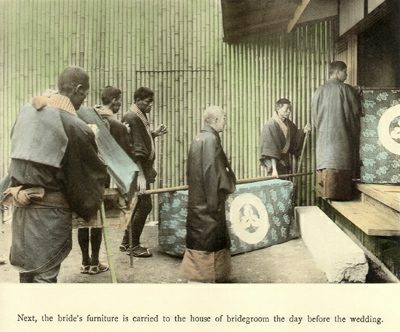 The Ceremonies of A Japanese Marriage, Kobe, The Tamamura, Photographic Studio and Art Gallery, T. Takagi, Proprietor, Meiji 45 (1912), 4th edition, oblong 8vo (7 x 10 1/4 in - 18 x 26 cm), English language, hand colored title page on textured paper, introduction, 19 hand colored collotype plates with captions, hard boards covered with silk type fabric, unpaginated. The actual images are approximately 4 x 6 in (10.5 x 15 cm). 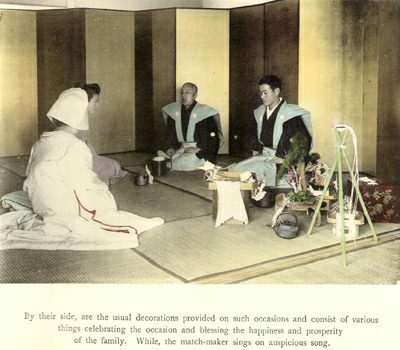 Pictorial depiction of several aspects of a Japanese marriage. Spans the sequence of events which include the male meeting with a "match-maker" and the actual marriage ceremony (a series of several pictures). 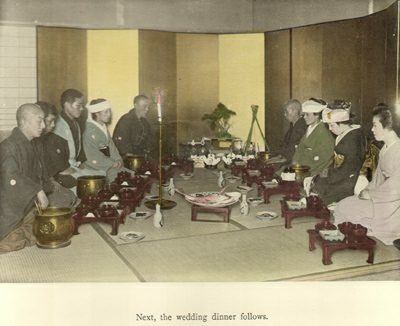 A 20th plate (wedding gifts) was added to later editions starting with the 5th edition of 1916. The colophon indicates this is the 4th edition (1912). Editions 1-7 spanned the period from 1905-1920. Later editons contain a 20th plate not found in this edition. General Comments Regarding Tamamura/Takagi Photographic Studio and Color Collotype Books. Tamamura Photography Studio in Kobe ca 1907. English language attribution statements found in colophons. 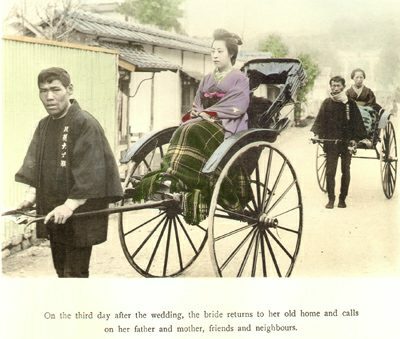 "Published by Tamamura, Photographer, Kobe, Japan" (first/last confirmed use - 1898/1907 (Meiji 40)). Tamamura colophon with an ink handstamps reading "T. Takagi." 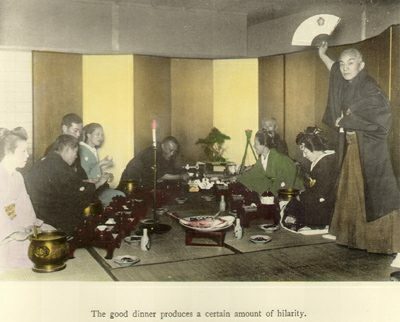 (only confirmed use - 1906 (Meiji 39), February. See: 1906, The Festival of the Ages, above. 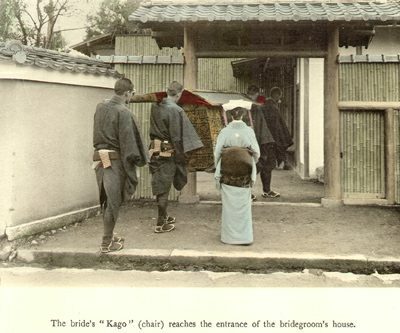 "Published by Tamamura, Photographer, Kobe, Japan, T. Takagi, Proprietor" (first/last confirmed use - 1907 (Meiji 40)/1909 (Meiji 42)). Colophon sometimes states "(Collotyped and hand colored.)" 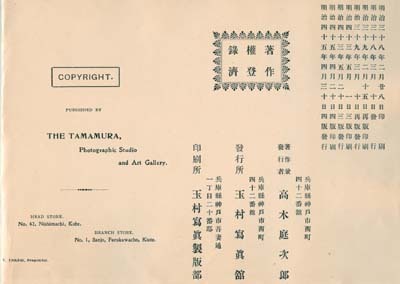 "'Tamamura,' Photographer and Art Publisher, No. 16, Sannomiyacho, Kobe, Japan, T. Takagi, Proprietor" (first/last confirmed use - c1907 (Meiji 40)). 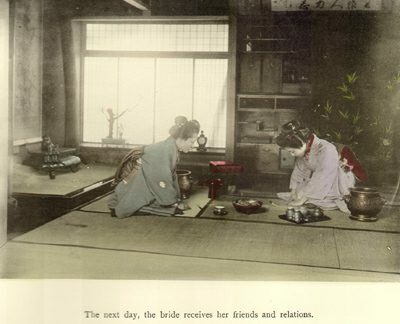 This destignation is also found on booklist slip inserted loose in The Rice in Japan published in 1907. 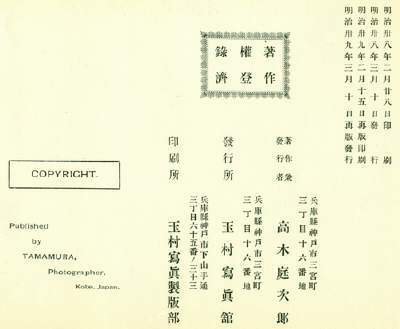 "Published by Tamamura, Photographer, Kobe, Japan, T. Takagi, Proprietor" with an ink handstamp reading "T. Takagi" (in script letters) (only confirmed use - 1907 (Meiji 40). See: 1907, "The Transformation of Mother Earth from Nature to Art, above. 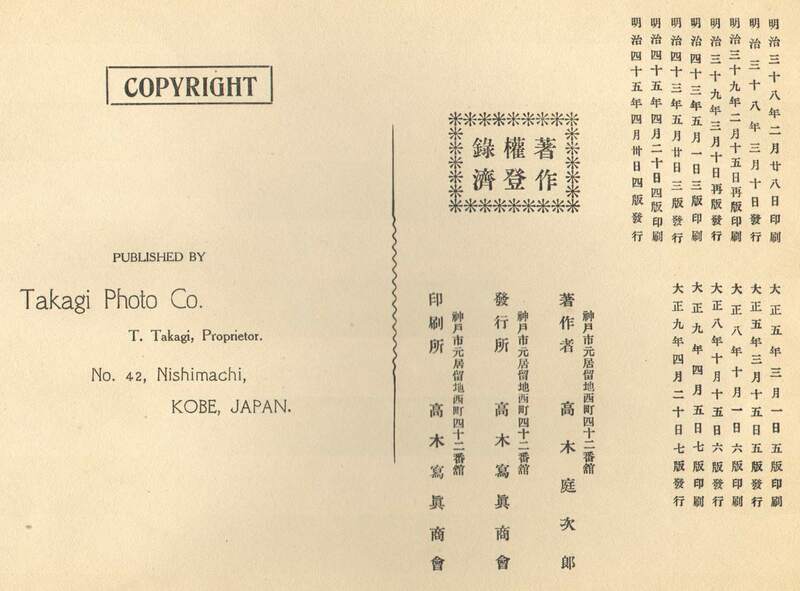 "Published by Tamamura, Photographer, Kobe, Japan, T. Takagi, Proprietor" with an ink handstamp reading "T. Takagi." 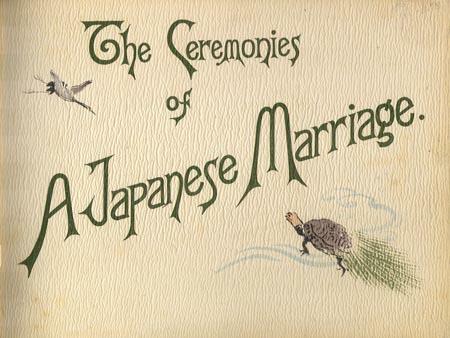 (in block letters) (only confirmed use - c1907 (Meiji 40). 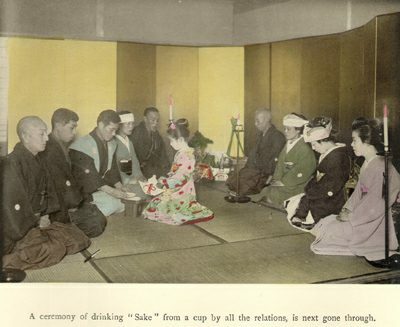 See: 1907, The "Ceremonial Tea" Observance in Japan, above. 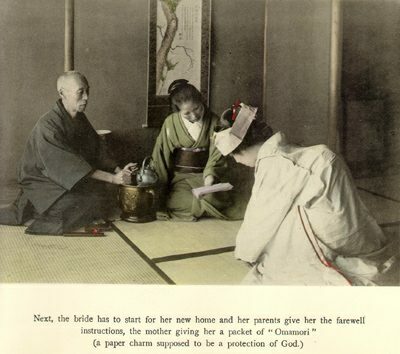 "Published by Tamamura, No 16, Sannomiyacho, Kobe, Japan, Photographer and Art Publisher, T. Takagi, Proprietor" (first/last confirmed use - 1908 (Meiji 41)/1908 (Meiji 41)). "Published by Tamamura, Photographic Studio and Art Gallery, No 42, Nishimachi, Kobe, Japan, T. Takagi, Proprietor" (first/last confirmed use - 1909 (Meiji 42)/1909 (Meiji 42)). 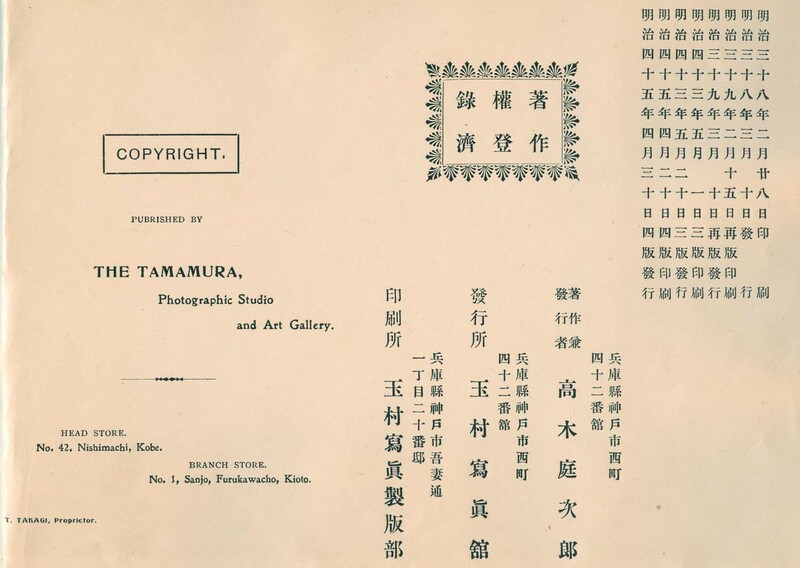 "Published by Tamamura, Photographic Studio and Art Gallery, No 42, Nishimachi, Kobe, Japan, T. Takagi, Proprietor" with "T. Takagi" ink handstamp in English and Japanese (first/last confirmed use - 1909 (Meiji 42, July)/1909 (Meiji 42, July), A Wintry Tour Around Fujiyama). "Published by Tamamura, Photographic Studio and Art Gallery, No 42, Nishimachi, Kobe (Head Store) and No. 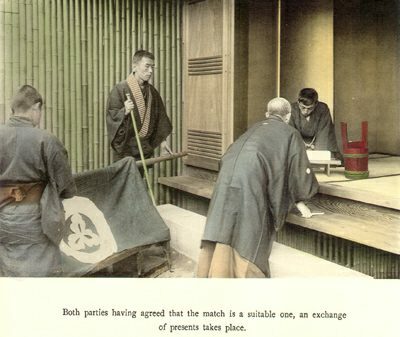 1 Sanjo, Furukawacho, Kioto (Branch Store), T. Takagi, Proprietor" (first/last confirmed use - 1912 (Meiji 45, April)/1912 (Meiji 45, April), Ceremonies of a Japanese Wedding, 4th Edition). 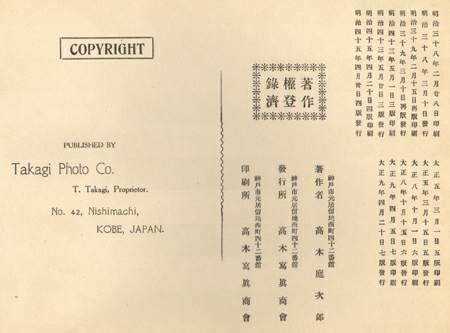 "Published by Takagi Photo Co., T. Takagi Proprietor, No. 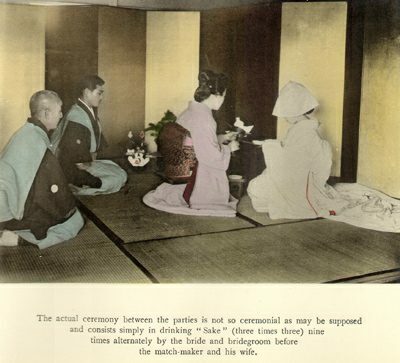 42, Nishimachi, Kobe, Japan" (first/last confirmed use - 1912 (Meiji 45, April)/1912 (Meiji 45, April), Ceremonies of a Japanese Wedding, 4th Edition). 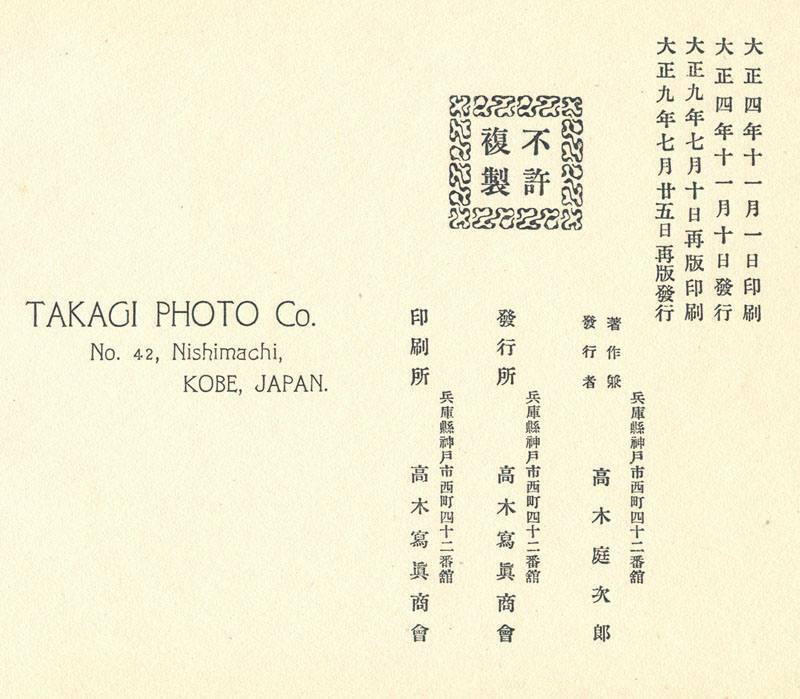 "By T. Takagi Photographic Studio & Art Gallery" no address (first/last confirmed use - ca 1918). This designation is found on the title page of Hills of Kobe which contains no colophon. 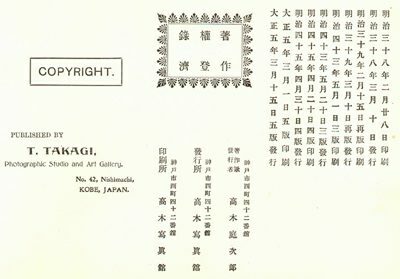 "By T. Takagi Photographic Studio & Art Gallery, Kobe & Kioto, Japan" contains Kioto as well as Kobe (first/last confirmed use - ca 1918). This designation is found on the title page of Views of Kioto which contains no colophon. It has the only reference to a Takagi operation in Kyoto that I have seen. "Takagi Photo Co., Kobe, Japan" or "By T. Takagi, Kobe, Japan" designation with no address(first/last confirmed use - ca 1919/Unknown). These designations are found on the title page. Found in the 50 plate versions of Japanese Views and Characters which contain no colophon. Sayonara T. Takagi Photo Co. 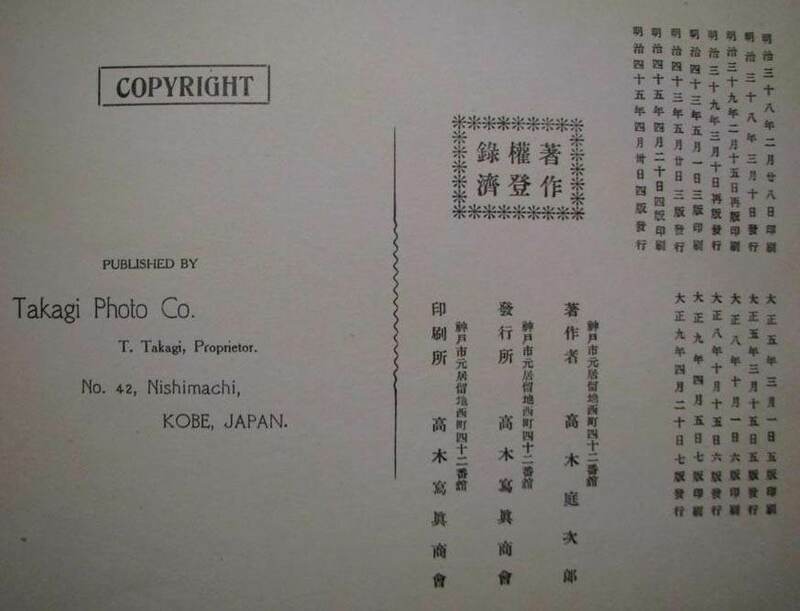 Rob Oechsle's comprehensive research into photography in Japan has established the date that the T. Takagi photographic and book publishing enterprise ceased operation. 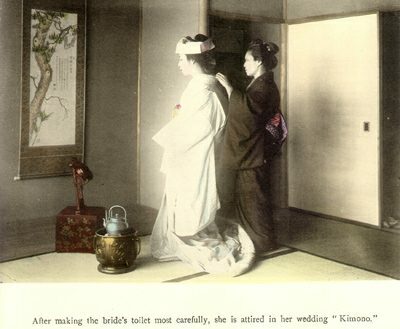 The date was March 4, 1924 as established by a notice published by the Futaba Shokai (Futaba Photographic Company), Takagi's successor. An image of that notice is here. Rob's website (T-Enami.org) is located here. I have not seen a book with the Futaba Shokai imprint. I have encountered several magic lantern glass slides with the Futaba imprint as well as black and white collotype picture post cards. The post cards carry a colorless embossed "Futaba, Kobe" imprint on the image side. Hand colored collotype prints (generally 10 or more per book). Book Format/Size. Horizontal format, generally 8vo (7 x 10 1/2 in) but sometimes large 8vo (7 x 16 in). Books are configured in Western format and read from left to right. Collotype Format/Size. Generally horizontal format images. Prints in the 8vo books have an image area of approximately 6 x 4 in. Images have English descriptive text printed below them. In some books the plates are separated by tissue guards but that is the exception rather than the rule. Covers/Bindings. Covers are generally hard (cardboard) and covered with a silk type fabric. The spine is covered with very thin paper. Often the covers have no illustrations are titling. Binding is generally accomplished by two string ties on the left edge. However, at least one book has been examined with a single string tie holding the covers and two string ties internally. Similar unillustrated covers were also used. Deluxe Editions. I have examined one book that was issued in regular and deluxe edition format. This is the 50 plate version of Japanese Views and Characters. Information regarding the standard edition book is here and information about the deluxe edition is here. The regular edition has the standard cloth over cardboard covers with a single tie. The deluxe edition has padded decorated silk over cardboard with double ties. The spine of the deluxe edition is covered with the same silk used on the boards and all edges are gilt. Additionally, the deluxe edition comes with a folding cover/case with two ivory type clasps. The contents of the regular and deluxe editions are identical. Typical Book Condition. The fabric covering of the boards generally has loss of fabric in areas long the edges. The covers generally have scrapes and small tears. The paper on the spine is almost always badly broken or completely missing. String ties are often loose. I consider these normal conditions and do not rate a book below Good just based on these conditions. Sometimes these books are found with the covers cut back/trimmed leaving only approximately 1 inch on the binding/tie side. In this state the internal title page appears to be the outer cover of the book. Who is "Tamamura the Photographer, Kobe"? This is the famous photographer Tamamura Kosaburo. Tamamura Kosaburo was in business during this period but his primary business location was in Yokohama, not Kobe. 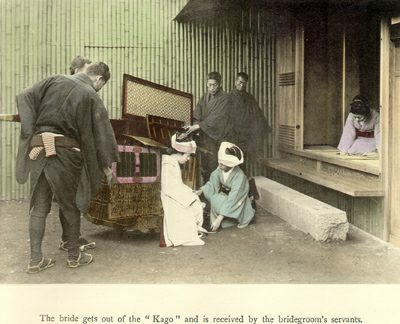 The K. Tamamura's studio was well know for it's work in hand coloring the albumen photographs (perhaps as many as 180,000) used in the 1897~8 Brinkley books. 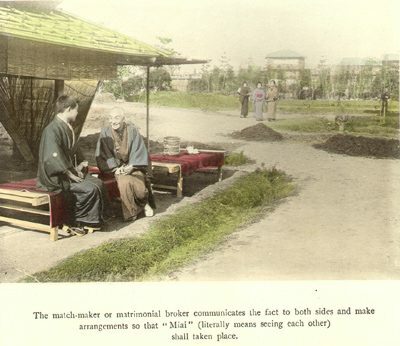 Tamamura Kosaburo was famous for his photographs which were generally produced as hand colored albumen (but sometime as collotype) photographs and marketed through his shop in Yokohama in the "tourist souvenir" trade. 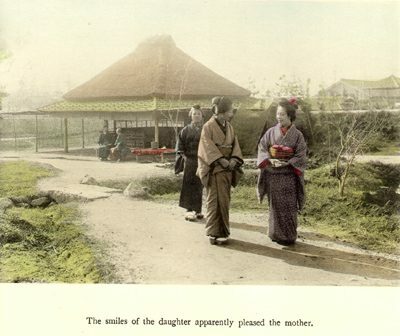 I have seen books with hand colored collotype prints by "Tamamura the Photographer, Kobe" dated as early as 1898. 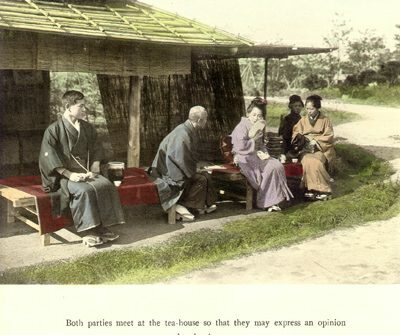 In his book Early Images of Japan, Terry Bennett notes that an advertisement in 1903 indicated that K. Tamamura had a branch office designated "No. 2 Kobe." 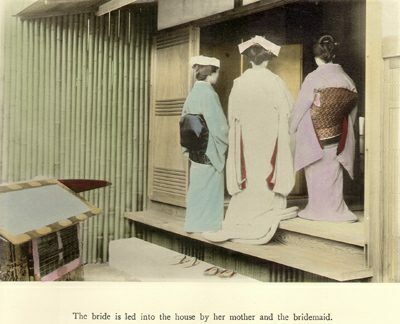 In Old Japan, Catalogue No. 30, (Nov. 2000) Sebastian Dobson states that Tamamura Kosaburo "...established a branch in Kobe around 1900 (see lot 123)." Based on the information I have available, I confident that Tamamura Kosaburo is the same person as "Tamamura the Photographer of Kobe." This branch office of the Tamamura enterprise appears to have had two major roles. First, it served as a marketing agent for the line of goods that were also offered in Yokohama. Second, and most relevant to this web page, it was the focal point for the marketing (and probably manufacture) of collotype illustrated books. The Transition from Tamamura, Photographer, Kobe to T. Takagi, Kobe. Terry Bennett has established precise documentation regarding the transition from Tamamura, Kobe to T. Takagi. The Japan Directory for 1903 lists "16, Sanchome (Kobe). K. Tamamura, Agent for Tamamura, Yokohama. Photographic Studio, T. Takagi, Manager." The directory for 1904 lists " K. Tamamura, 16, Sanchome (Kobe), Agent for Tamamura, Yokohama, Photographic Studio, T. Takagi, Proprietor." 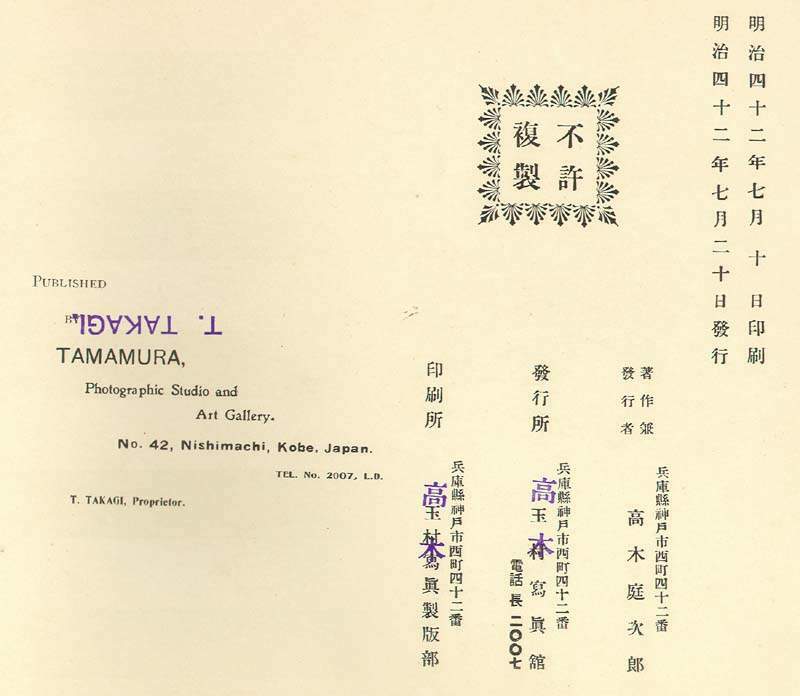 While the transfer occurred in late 1903 or early 1904, it appears Takagi did not use his own name in the colophons of the collotype books he marketed until around February of 1906 and did not drop the Tamamura name entirely until 1913. 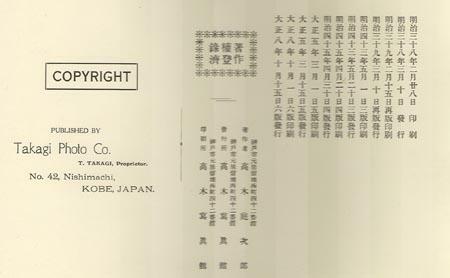 Takagi marketed a "Tamamura the Photgrapher, Kobe" book with a colophon date of 1907 (The School Life of Young Japan) with no mention of his name except in a loose slip advertisement. It is clear that Takagi marketed Tamamura's images and books, sometimes with his own imprint and sometimes without, long after he acquired ownership of Kobe enterprise. Comparison with Known Kosaburo Tamamura Book. 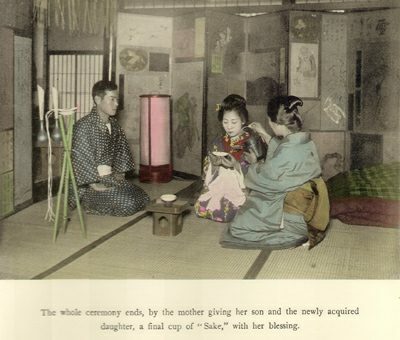 A known color collotype book published by Kosaburo Tamamura is A Leaf From the Diary of a Young Lady. For more information on this book, click here. The format and titling on the collotypes in this book are very similar to the Tamamura/Takagi books. Glass Slides. 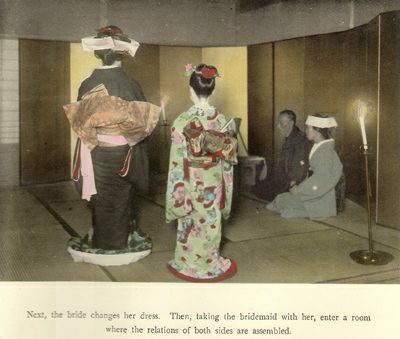 Both Tamamura and Takagi marketed Japanese images on glass (magic lantern) slides. These were hand colored and measured approximately 3 1/4 x 4 in. Kelly & Walsh Marketing. I have examined books between 1907 and 1916 which bear a Kelly & Walsh, 78 Main Street, Yokohama, bookseller's label at the upper left on the inside front cover.